—Murillo, Bartolomé Esteban. The Adoration of the Magi. 1655-1660. Toledo Museum of Art, Ohio. 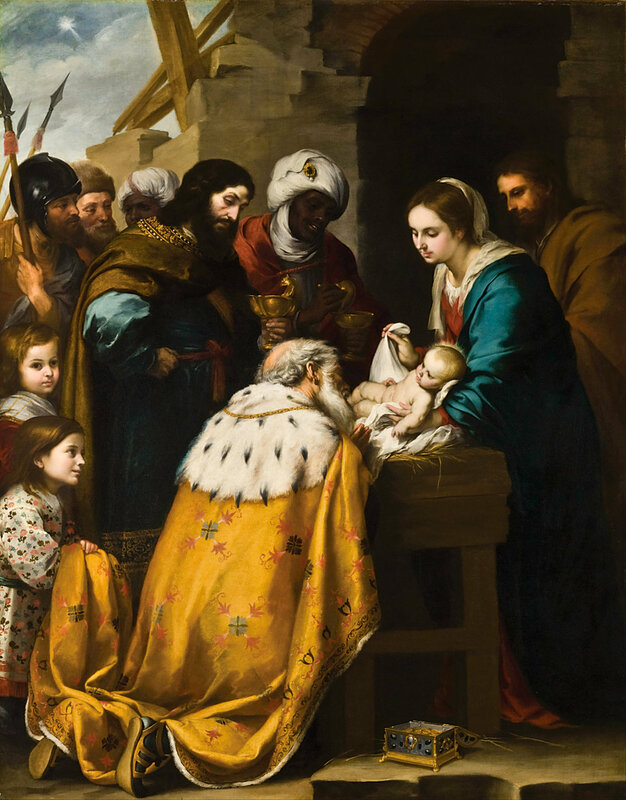 SOME THOUGHTS: We come to the day known as Epiphany, the revealing of Christ to the nations. Epiphany is actually an older holiday than Christmas Day. When “a light goes on,” we say someone has had an epiphany. New light is shed on something that was hitherto not seen or recognized. Throughout the Old Testament, it was clear that God would bless His people as they exercised obedience to the law. He had made a covenant with His people. He also said that through Abraham, all the families of the earth would be blessed. From time to time, non-Jews had a role in the unfolding of God’s plan (E.g. Rahab). But clearly, the thinking of the Jews was that God was a God for the Jews. The Gentiles were outside the fold. To be accepted, Gentiles had to submit to Jewish law and practice. This was an issue of discussion in some of the epistles in the New Testament. The visit and worship of the magi was an epiphany! Non-Jews worshiped the Messiah, the King of the Jews. Throughout the Scriptures, the people were told to worship God alone, never a person nor any kind of image. Yet, here the men bow down and worship the baby as the Messiah, Emmanuel, “God with us.” The reality set in. Jesus had come as King and Savior for all peoples and nations. The promise to Abraham 2,000 years earlier was now a reality. If you read the additional Scriptures listed above, you will see how this visit of the magi was prophesied hundreds of years earlier. God provided a GPS star to guide the worshipers! People have surmised there were three wise men based on the three gifts, but as you read, the Scriptures do not specify how many there were or how soon after the birth they arrived. In a dream, the Lord told them not to go back to Herod, but to leave via another way. Christianity is the most inclusive faith in the world. Jesus Christ came for all human beings, all tribes, all nations, all peoples, all cultures. Jesus is the Light of the world. In Him is no darkness at all. May the Christ light epiphany shine this coming year. The world is a dark place. PRAYER: Almighty and everlasting God, the Brightness of faithful souls, fill the world with Thy glory, we pray Thee, and show Thyself, by the radiance of Thy light, to all the nations of the world, through Jesus Christ, our Lord. Amen. POSTSCRIPT: Thank you all for being a part of these past thirty-five days. I trust that the Scriptures have encouraged you in your walk with the Lord as we looked into the Old and New Testaments. But most of all, I trust you have drawn closer to our great God, Father, Son, and Holy Spirit and that He has spoken through His words and communed with you day by day. My hearts desire is that you have established a pattern of opening the Scriptures every day and searched the mind and heart of God that you might grow ever deeper in your love and obedience to our Lord and King. Lent is just around the corner beginning February 13th! Watch for this year’s Lenten Devotional.